After so many devastating losses here lately I’m happy to finally have something positive to talk about. 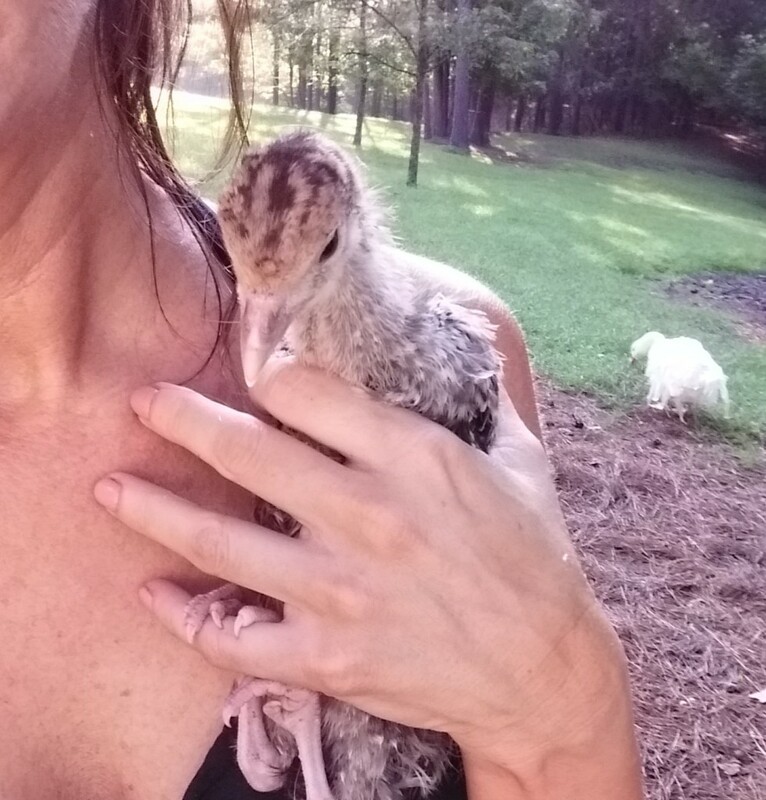 In one of my previous posts about flea market animals I wrote about buying two turkey poults (baby turkeys). Unfortunately, I made a rookie move and was too distracted by the seller’s other animals to notice she put a deformed, sickly poult in my carrier. When I arrived home to inspect the newbies I immediately saw one was hunchbacked and couldn’t move its neck, it seemed stuck to it’s body. One of it’s wings jutted out at an odd angle. I was pissed. The seller wanted to get rid of a dying poult and I was the unlucky person to take it home. After the death of Rupert I was desperately trying to replace him and now I was about to have yet another loss. This poor baby seemed to have full movement of its legs but appeared to be paralyzed in the rest of its body and neck. I made sure the babies had plenty of food, water and a clean, spacious cage and put them to bed. I was deflated and fully expected to find the baby dead by morning. 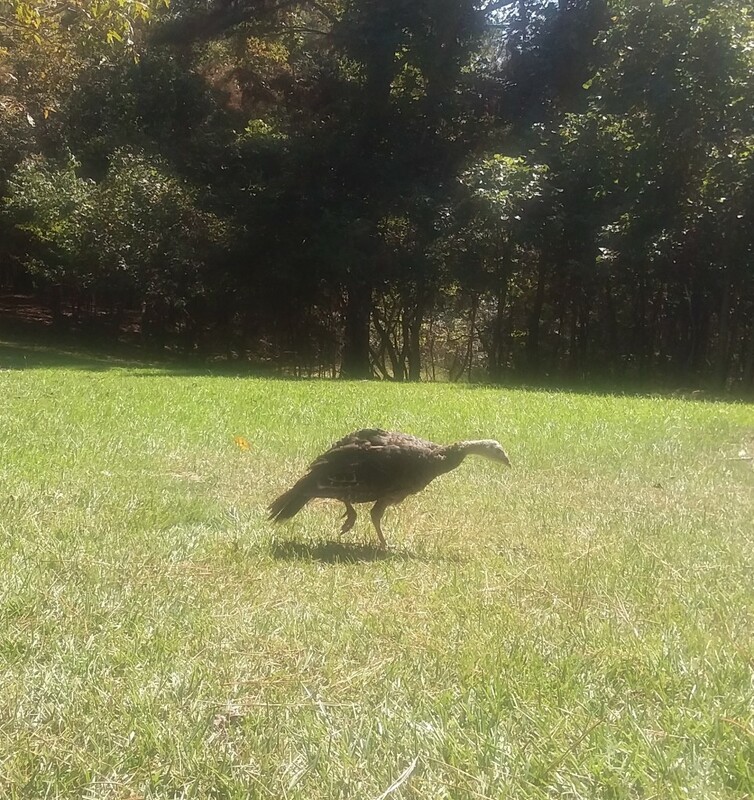 The next morning I was surprised to find the poult was still alive. I was even more surprised to see all the food I left them was gone. Maybe I had a little fighter after all or the other one was a pig. The days passed and the poult seemed to grow a little stronger. I worried over its quality of life. It would be more susceptible to predators and what about mating season? With the level of extreme deformity I would have to keep it separated from the others and I don’t like to do that. 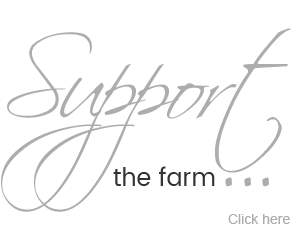 Housing is an issue for special animals as it is and I feel guilty when an animal doesn’t flourish or has to be separated. I watched as the healthy poult quickly grew stronger and much larger while my sickly one lagged far behind but was improving nonetheless. I was cautiously optimistic but still worried over its future. After several weeks of being cooped in the barn I could tell the healthy poult was restless and ready to get outside. In the past, Rupert would take babies in immediately and raise them as his own. He always ensured their acceptance with the other animals. God, I miss that boy. Finally, I turned the poults loose in the safety of the pen. Much to my dismay the other turkeys wanted nothing to do with the babies. Fortunately, after thorough inspections the adults ignored the babies instead of trying to hurt them. 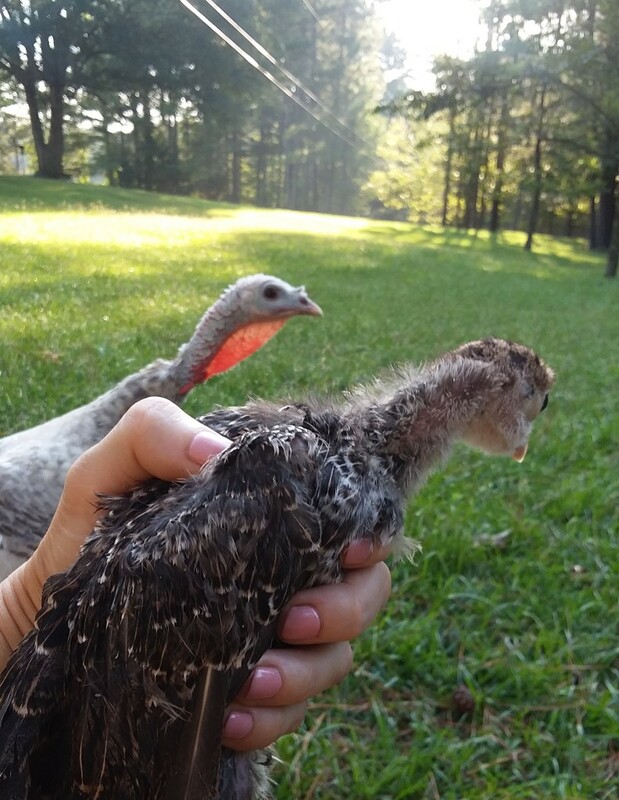 At first, the poults were fearful of their newly-f0und freedom but after a couple days they settled right in to farm life. The healthy poult, as expected, has flourished and grown. The most unbelievable part for me is my little sickly poult not only experienced a growth spurt but after a couple weeks of freedom suddenly has full use of it’s neck and body. It’s almost caught up in size to the other and the hump in it’s back seems to have disappeared as well. How amazing does this baby look now? ?